The Battle of Chelsea Creek was the second military engagement of the Boston campaign of the American Revolutionary War. It is also known as the Battle of Noddle's Island, Battle of Hog Island and the Battle of the Chelsea Estuary. This battle was fought on May 27 and 28, 1775, on Chelsea Creek and on salt marshes, mudflats, and islands of Boston Harbor, northeast of the Boston peninsula. 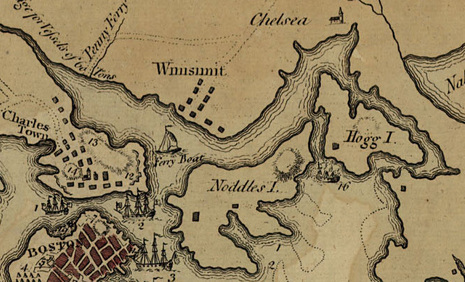 Most of these areas have since been united with the mainland by land reclamation and are now part of East Boston, Chelsea, Winthrop, and Revere. The British colonists met their goal of strengthening the siege of Boston by removing livestock and hay on those islands from the reach of the British regulars. The British armed schooner Diana was also destroyed and its weaponry was appropriated by the Colonial side. This was the first naval capture of the war, and it was a significant boost to the morale of the Colonial forces. The British first took notice when they spotted the smoke from the burning hay. Vice-Admiral Graves on his flagship, HMS Preston saw smoke from the burning hay at about 2 pm, and signaled for the guard marines to land on Noddle's island, which they did, engaging Stark's scattered forces. Graves also ordered the schooner Diana, under the command of his nephew Lieutenant Thomas Graves, to sail up Chelsea Creek to support the operation and cut off the colonists' escape. Eventually, a combined force of roughly 400 marines was landed, formed ranks and began to systematically drive Stark's men back to the east. The colonists fled without fighting until they reached Crooked Creek. There they dropped into marshy ditches and fired on their pursuers from strong defensive positions. A pitched battle followed, in which the colonists "Squat[t]ed down in a Ditch on the ma[r]sh" and engaged in "a hot fiar untill the Regulars retreeted".